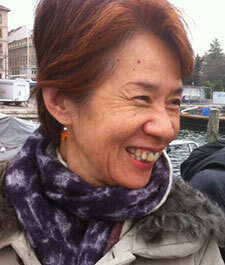 Hiroko Sakaguchi san is a second generation hibakusha from Nagasaki who was born on July 22, 1949. Ms Sakaguchi’s mother was exposed to the atomic bomb at age 23 in Nagasaki, 3.5 kilometers from the hypocenter. She passed away from rectal and lung cancer. The children of Ms. Sakaguchi’s uncle and aunt were 500 meters from the hypocenter and passed away within 10 days after the bomb. Ms. Sakaguchi is the former manager of the Nagasaki Prefecture Association of Children of Atomic Bomb Victims and of the Liaison Council of Children of Atomic Bomb Victims in the Nagasaki Prefectural Government employees’ union. She also participates in supporting legal action for fair support for overseas hibakusha, especially those in South Korea.